Ahh - thanks - JJWMACHINECO that makes more sense, in the demo mode I do see the S command. I have emailed John the kale instructions anyway, lets hope I didnt make a bad purchase. BTW - Ive made a few Mayan calendars now, one is destined for a table top but ive never seen a lasered one - good job! Heres hoping my little 2w laser turns out as good as your blue one. Others have tried engraving with a 808nm without very good results for some reason. Kale sells a 445nm though. I know you don't want to hear that, but it may have been there implementation is why like it not being focused properly. I don't know for sure because I never tried one. switching between say engraving and cutting it has it’s merits. The KaleCNC laser comes with instructions for mach3 config which include pulley setup. I looked like a good compromise for being able to have it mount to my CNC machine in a removal way and just have a separate profile for mach3. Hopefully i can use one of the spare axis outputs to be a spindle pwm output and then I can just unplug when its not being used. I am interested in your comment about severe update speed limitations, does this imply that my feed rate will have to be slow. I'll be happy with 30-40ipm anyway. 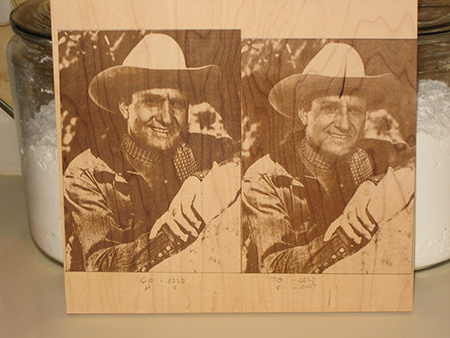 As laser etching is as good as silent it could run all night without upseting anyone. Mach3 can output the PWM signal on any spare Output pin of you choice which has to be set as the ‘Spindle Step Pin’ in Config / Ports & Pins / Motor Outputs but I suspect your KaleCNC instructions have already explained this and the other set-up requirements. As said, Mach3 makes a poor job, as far as speed is concerned, in updating any changes in the Sxxxx command within the running GCode and laser’s are extremely fast acting devices so you may be limited on your available feed-rates. I think you will just have to try it and see if the results you obtain are up to your expectations for the type of work you are planning to do. For safety reasons, typically one of fire, I don’t recommend that a running laser machine is left unattended especially overnight. Many things can cause Mach3 to lock-up or a PC to throw a wobbly possibly leaving the laser on full power in just one spot on the work. If something can possibly go wrong then sooner or later it will go wrong so please take care and be safe my friend. If it does not work out good for you with PWM with the S speed command, a rebuild using a Flexmod P3 analog/TTL modulation driver may be in order. Then a MA3 shaft encoder or a DAC could be used to control the lasers intensity. It's a proven setup that most of us use. Both of our machines use the MA3 and our dual 445nm LD machine which is 4.5W max is able to raster engrave at blended feedrates in Mach at 225 + IPM depending on materials. Our 445nm 1W engraves at a BFR of 50 IPM depending on the material. I would think your 2W should be able to engrave around 100 IPM depending. I know speed is not important now, but in time your going to tell yourself, darn I wish this could go faster. Been there, done that. John sent me the photo so Cat could do some comparison testing. Still have a ways to go on learning how changes in PEP and burn Affect the outcome, however am showing some improvement. John and Jeff continue to be of great help. 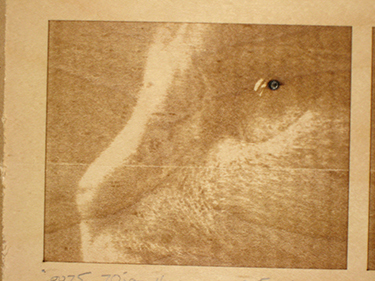 Also to highlight note by TweakIt above, notice the burn spot in the Cat's Eye. Machine stopped for unknown reason and burned spots. E-stop so not tripped LD remaind at whatever When power was stopped. I was in shop and do make it a practice to check time-to-time on progress. Images burned at 60 ipm, 0.0075 "resolution, no edit on photo. Could you keep me updated on what you find out your Caused machine to stop? I've had happen while setting up hurt but never while it was doing the burn but I worry about it. Some of my burns will last all night, and I go to bed but can not sleep. I Worry About That little hole going all the way to the shop floor. Also what is the size of cat hurt? I see what looks like a dark line in one and white line in the other horizontal hurt did you burn? That happened to me a couple night ago about 10 times at around 2 AM at 45 deg. burn for 30 inch piece. Need I will do it again but Ill need to stop the white lines first. The engrave was real good at the start and good at the end but it messed up in the center. Randomly occurring things really stink. Don't you know you should not play around with your cat with a laser pointer. You could take out one of there eyes doing that. Looks very good. I had the Hickups (lines) happen to me too. It would only happen once in awhile. It was an intermittent connection. We had to go through every darn connection until the problem finally went away. Unfortunately, don't know which one it was. Previously I had a intermittent connection problem with the encoder 0-5 volt signal from the encoder due to the plug connection on the enclosure. I'll recheck. Agree, those intermittent problems are very hard to find. Most times I just have to hunt and peck until problem goes away. If do find, will post. Burned these today. Machine did not stop and the mystery line did not repeat itself. Only thing I did was check the encoder connection to make sure it was good. Maybe this did the trick. Never know for sure. The burns were for testing; have not fine tuned. Left was done 0.007 res, horz., -0.0220 max (about 1.6 amps), 60 ipm. Right was 0.0075 res, vert., -0.0220 max, 70 ipm. Size is 5"x7". Note to Jeff: And yet more points for the encoder. 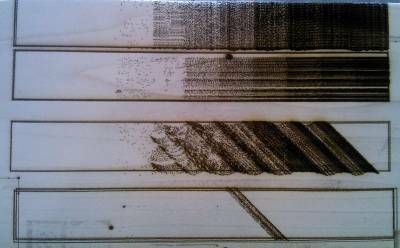 Well my 808nm laser arrived, I've hooked it up and at least it burns wood. So far just tested with some simple box shapes at around 4" per min. Much faster and it stopped burning, although I suspect I can focus it better that I did. One question though, so far the PWM output from Mach3 does nothing, is there a simple way I can check that there is a pwm output on the pin - I don't have a scope. You could try connecting a 10K resistor in series with the pin then a 1uF capacitor between the unconnected end of the resistor and GND then measure the voltage across the capacitor. At max. RPM you will get close to 5 Volts (or 3.3 Volts, dependant on your parallel port) and at min. RPM not far off 0 Volts - assuming the Mach3 PWM out is configured correctly. Well I'm messed up again. The white lines I was getting, I now got-um. My machine was doing this sometime ago and I can not remember what fixed it. One of you-all had me do something and I did but what was it? This is Johns little body thing, I know it's hard to tell but I do not care about the color, I just used it to see If I could figure out what is going on. Top is vertical, horizontal middle, and bottom 45 Deg. I think it is telling me That something is goofed up on the X and Y axis. It looks like it bunches up and than plays catch-up and there is the white lines but?,?,? I just do not know. 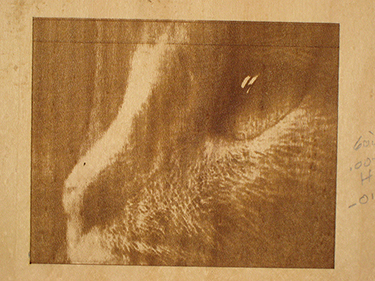 This is my C02 laser, PEP 426, dither, 3 pixel width (around) .01 pixel resolution, Analog Laser, 75 IPM. Analog so as I used to skip white and use 45 Deg. I do not think harm Analog is what is doing this. It started to do this half way through the real big project, and the more I tried to fix it the Worse It Gets. None of the axis's lose and there seem to be all clean and smooth. The stepper motor might be having a problem but I have not figured out what to do to test this. I have been playing with Mach velocity and acceleration but it does not seem to do much. Might be, this machine is telling me to retire and go fishing. Posts 45 through 60 there was the same problem and it went away, I'll recheck. What I think I need to do is get a better understanding of Mach 3 Velocity and Acceleration. Velocity and Inches Per Minute are somehow related. and Acceleration is how fast you spin your tires in first gear. Maybe, I think? First, running 45° angles with dithered images offers no advantage. Until you can fix this again, stay with horizontal only. Second, set your velocity at 100 and your acceleration at 30, and run some tests. These may not be the best settings, but they are conservative for a belt drive machine. Third, leave the pixel resolution at 0.01. Set your feed rate at 60 ipm. Again this may seem slow, but you can always go faster later. Run some test images with these setting and post what you get. Thanks Tweakie - I did the test you suggested and Im reading 5v regardless of the mach3 settings. I think I'll do some tests directly on the parallel port and see what I get next.